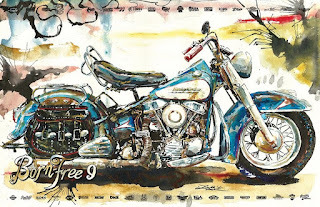 The Born Free Show, for those of you who haven't heard about it, is a motorcycle show about the love of old motorcycles and like-minded individuals having a good time together and enjoying these bikes of the past. It is also a family event, young and old a-like are welcome to come out and enjoy the show. This show is meant to unite people from all walks of life by bringing the passion that we all have of these old machines together for two special days. If you come out to the event please be prepared to have a great time, see neat old bikes…lots of neat old bikes, in a peaceful, friendly, family environment. Started as a small "get-together" in 2009 the show has grown to become the premier chopper show on the west coast bringing fans and enthusiasts from around the world. 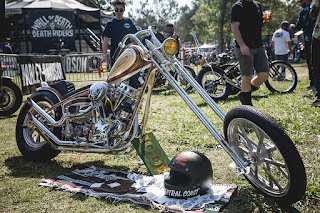 Daril Borba's 1949 Panhead and Show Class Magazine People's Champ winner at Born Free 8! Born Free is a collaboration between BORN Loser (Mike Davis) and FREEdom Machine & Accessories (Grant Peterson). If you wanna buy your Born Free 9 Grass Pass Ride In admission bands, Poster /ticket combos to win the motorcycles, hats, tees and decks you need to act quickly. The online cut of to purchase is Wednesday June 14th at midnight. Visit https://www.losermachine.com/collections/born-free to get what you need before its too late. This year, The Born Free Show was graced with a huge sponsorship! Big thanks to BAKER Drivetrain for supporting Born-Free. The folks from Born Free will be giving away a $3000 Baker 4 Speed Transmission in an upcoming promotion. In the meantime please read and learn about this awesome transmission. The introduction of the Knucklehead and the 4-speed in 1936 marked an epoch in the history of American motorcycles. Many consider the period of 1936-1984 the holy grail of Harley-Davidson. To carry on that legacy, BAKER Drivetrain developed the BAKER 4-speed Transmission. The external architecture of the BAKER cast 4-speed transmission case was modeled after factory cases to capture all of the details and character of the original design. BAKER Drivetrain has made many functional upgrades to address the shortcomings of the original design like leaks, serviceability, and durability. The loose rollers on the main drive gear were replaced with a radial ball bearing. The bronze bushings on the gear set were replaced with caged needle bearings. BAKER Drivetrain added a provision, hidden in the back of the case, for an electronic speedo but retained the traditional worm gear speedo provision on the front of the case. The stock Fred Flintstone shift detent was replaced with a snot-slick linear ball bearing detent for that smooth "snick-pop"™ shift quality that BAKER customers expect. The BAKER 4-speed transmission is available with a ratchet top or jockey top cover and has three different case finishes available: classic raw finish, wrinkle black finish or polished finish. BAKER offers three variations of the shift drum and offer four different lengths in main shafts. All BAKER 4-speeds come standard with the BAKER Klassic Kicker Gears. 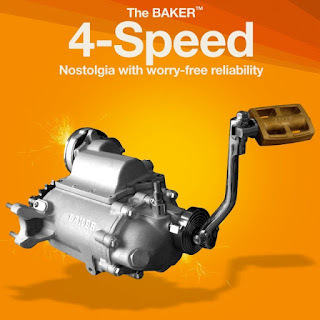 For more information on the BAKER 4-Speed Transmission, go to www.bakerdrivetrain.com/products/harley-4-speedtransmission-assembly. BAKER Drivetrain continues to introduce new solutions based on empirically-based inspiration as they ride their American V-Twins and get ideas from their American riding buddies using their proven engineering methodologies. To maintain their reputation of quality as they develop products, their strict research and development practices will never be compromised. Bakerâ€™s iron-fisted protocol of an intense attention to detail will always be exercised in manufacturing to continue to earn their position as the American Motorcycle Drivetrain authority. Convinced that BAKER Drivetrain produces the best products out there, the team at BAKER Drivetrain stands shoulder-to-shoulder behind the guaranteed products that they release with plain-English-speaking technical support before and after your purchase.